Scandinavian-based slot developer NetEnt are becoming increasingly reputed for their branded online slots with fantastic receptions to previous slot releases including the hilarious South Park slot and the slightly more menacing Scarface slot. Creature from the Black Lagoon is based on the classic 1954 movie of the same name that was directed by Jack Arnold and starred Richard Carlson, Julia Adams and Richard Denning. It was a revelation at the time because it was released during the 1950s fad era of 3D viewing. It has since gone down as one of the classic horror movies of all time thanks to the notoriety of its lead villain... the Creature! The question is, has the NetEnt slot release of this classic done the movie justice? This slot is a 5-reel, 20-payline slot has all the characters from the movie including Dr David Reed, Kay Lawrence, Mark Williams and, of course, the Creature, aka Gill-man, on the reels. The slot also comes with Stick Wilds that are represented by the Wild symbol and can substitute for all other symbols except for the Free Spins symbols to complete winning combinations. You can trigger the free spins bonus round by hitting three or more of these Free Spins symbols across the reels during regular game play. The number of free spins you get depends on how many Free Spins symbols you trigger the bonus feature with but there is the potential to be awarded up to 20 free spins initially. This free spins bonus round is a little different to your average free spins feature on other slots. You not only have the free spins to keep you entertained but you also have the chance to win Spreading Wilds by shooting the Creature. When the free spins are triggered, the reels move into an underwater setting. A target symbol is added to the reels and at random intervals the Creature will swim around like he owns the place in the background. If you are lucky, then you will hit a target symbol on the reels at a point where the Creature is swimming in the background. If this happens you will shoot the Creature and trigger the Spreading Wilds. These Spreading Wilds can stretch across up to three symbols horizontally when triggered. 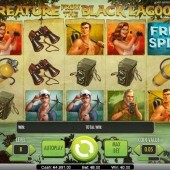 If you manage to kill the Creature by shooting him enough times then you will be rewarded with another 10 free spins. 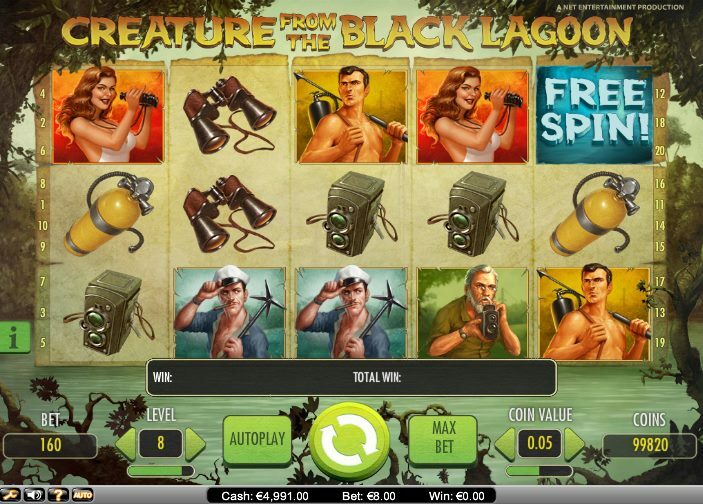 Creature from the Black Lagoon is all about this superb free spins bonus round. There aren’t that many slots out there that can make a free spins bonus round fun and fresh without confusing it. NetEnt have done a great job of keeping it simple but maintaining the innovation levels in this free spins bonus round. Overall, it is easy to see why there was a lot of hype surrounding this slot’s release. It has the backing of a well-known movie title with sublime graphics, quality gameplay and a bonus feature that will make many other branded slots very jealous. NetEnt have surpassed their previous horror-movie inspired slot in the form of Frankenstein with this latest release so definitely check it out!